Looking to create a space-themed bedroom for a toddler? Or maybe add star motifs to a nursery? We’ve got you – and your walls – covered! Whether in the planetary sense of the word, or in their more abstract form, stars are a a great topic to introduce to any kids’ bedroom. You can use them as motifs in an overall space=themed nursery or just for their visual appeal. And kids love them, so they can make the room into a fun place for the young ones to spend time in. 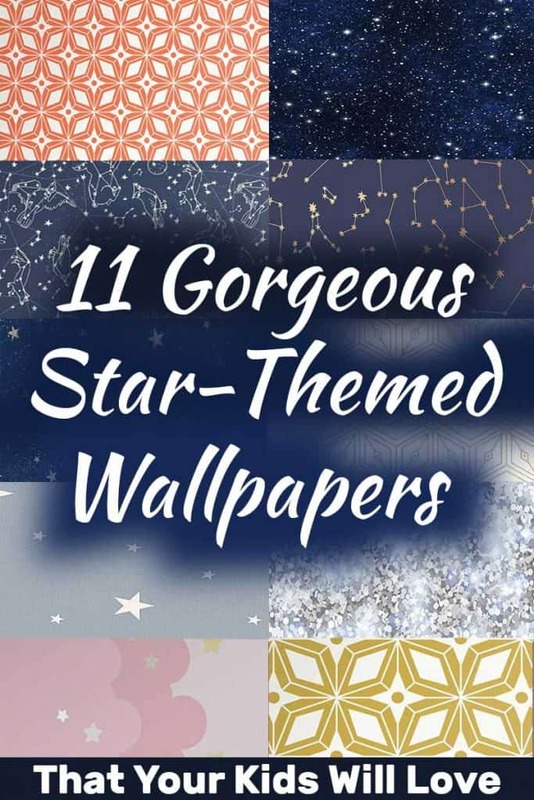 Let’s take a look at some fantastic star-themed wallpaper options you can easily and quickly offer right off Amazon. Kids tend to have very far-fetched imaginations, making it perfect sense for their bedroom to be filled with energetic colors and vibrant wallpapers. This is why a backdrop of brilliant vibrant stars make sit easy to transform their rooms into playful environments. The artist manages to catch the beauty of space, going so far as to pay individual attention to each tiny speck on the wallpaper. Your children will wonder why some stars have more luster than others, or why a select few stars have the red shift effect, which is certainly an unusual detail on a wallpaper that is otherwise full of white dots. This should open up a pandora’s box of questions, which could be just what they need to learn more about outer space. If you love this wallpaper, click here to buy it. Want to take your children’s playful creativity to the next level? This ‘glow in the dark’ wallpaper by A.S. Creation is made up of material that shine in the dark. It could be just the push they need to go to bed early, once they get excited enough to explore the limits of their imagination by glancing upon the bright stars. This wallpaper creates a relaxed yet playful feel that has a modern spin to it. It allows you to transform your space with minimal effort. The backdrop is completely washable in washable, making maintenance relatively easier. 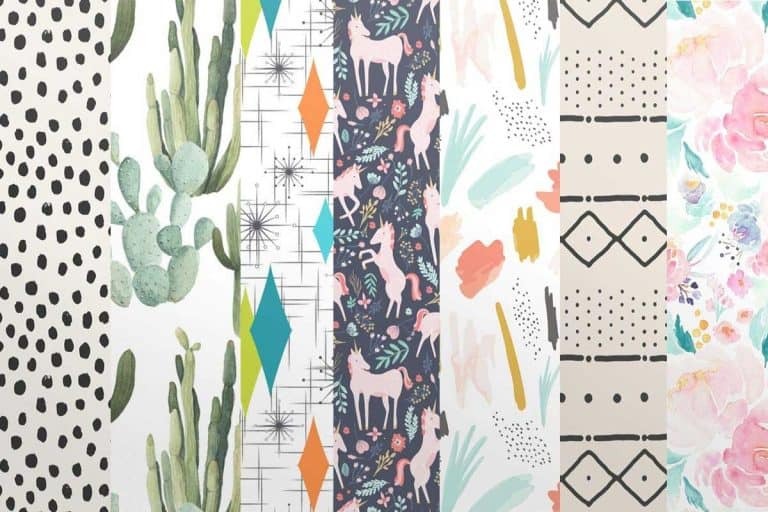 Spoonflower has mastered the craft of manufacturing wallpapers that allow you to personalise your room without breaking the bank. The geometric gold star pattern is a unique wallpaper that will form a special bond with your children. The deep gold background is truly transformative, as it allows your children to be at peace in their tiny abode, peacefully drifting off into a slumber. This design is perfect in a child’s bedroom or a baby’s nursery, and would easily become the main appeal of your home, just as your child’s room should be. 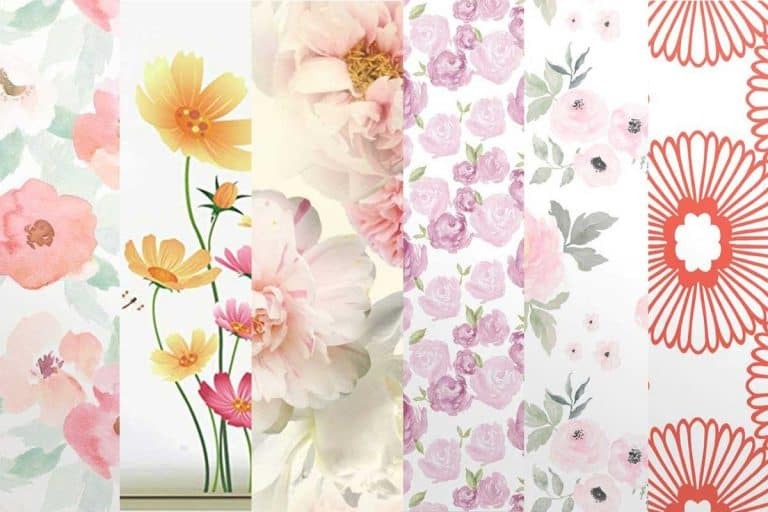 This wallpaper is available in four different designs and a test swatch. Make sure to buy the test swatch to see how it goes onto your wall before bulk ordering. The great thing about this wallpaper is being removable, allowing you to experiment with it to your heart’s content without damaging the fabric, the wall, or the ink. A great aspect about this wallpaper is that it features a matte finish with a smooth texture made using polyester fabric. The wallpaper is extremely durable and will last a long time after purchase. It is entirely removable, making it possible to experiment with it. The backdrop is made using non-toxic ink that is environmentally friendly. This wallpaper can be bought in three different sizes, so make sure to do your homework before bulk ordering. The unique color palette by the artisan features a bright gold paint against a backdrop with off-white tones. This creates a unique pattern that budding astronauts are going to love. The softness of the gold creates warm and calm impact, while depicting a vintage yet futuristic look through the unique starry pattern. You can style this wallpaper against accessories featuring neutral color palettes to compliment the bright, crisp, and clean design. Since this wallpaper is designed by Spoonflower, you can expect it to come with all the bells and whites their wallpapers are known for. You can buy this wallpaper in four different sizes. Click here to buy this fully removable wallpaper. Dazzle your little ones by bringing the universe into your home. This wallpaper comprises of an elegant and simple design that features delicate stars mimicking constellations in the night sky on a deep blue background. It is definitely very stylish and gets full marks from our side in the design department. Each constellation tells a story that is bound to stimulate their imagination. The versatile design of this star wallpaper will match most interior styles, creating a playful edge they might desire. You won’t have to worry about the ink fading away any time soon since it is digitally printed on the polyester wallpaper, etched permanently onto the fabric. This makes maintenance relatively easy. The wallpaper is made using environmentally friendly materials, so no formaldehyde, PVC or phthalate- compounds. Constellations are a permanent feature of our night sky, but modern technology has limited their exposure in urban areas with artificially illuminated streets. This wallpaper provides a unique opportunity to bring that timeless night sky into your baby’s nursery. The colorful, bold constellations can complement relatively lackluster backgrounds and brighten them up with minimal effort. The wallpaper can be purchased in different colors including a vibrant splash of blue, neutral grays, and shiny white. Each background color perfectly complements the golden hued stars to ensure your room looks starry and inspirational. This wallpaper is 100% kids friendly and does not feature toxic materials such as phthalate and lead. Click here to buy this wallpaper by Novogratz. Spruce up your nursery with the pink sky wall that features an eclectic design. It is no doubt a great addition to your children’s bedroom if you’re looking to infuse positivity and fun. The subtle tonal variations in each layer of pink should bring add a ton of flair into your baby’s nursery. The artisan felt it was appropriate to add the crescent moon that has anthropomorphic features – miming sleep. The wallpaper is designed by Murwall, a renowned name in the textiles industry. Their wallpaper is built for long lasting years, as such, the fabric is breathable, is resistant against UV rays, and does not get affected by humidity or moisture. Maintenance is no longer going to be a chore with this wallpaper. Simply use a moist cloth to wipe away at the smudges and dirt. The ink is made using HP latex, so it won’t fade. This enchanting wallpaper by Rosotery offers a soft approach to sprucing up your room with a gentle splash of geometric patterned wallpaper. The artist carefully designed an orange colored star and repeated the pattern a dozen times. This wallpaper will work brilliantly in a playroom or nursery. 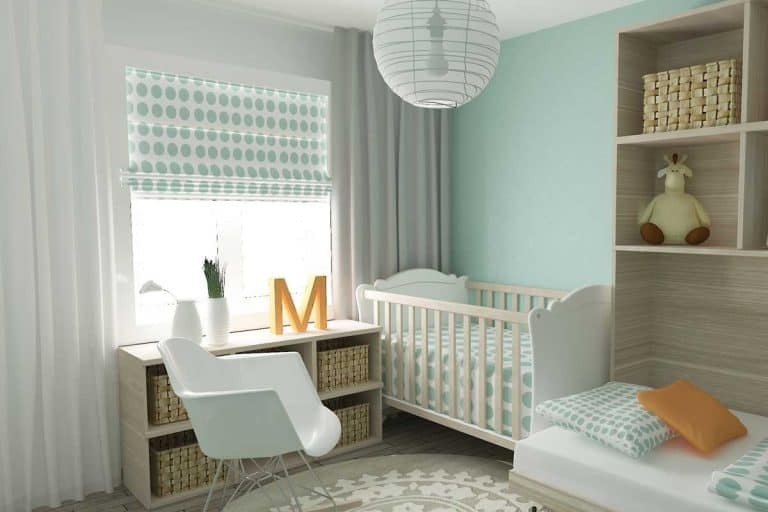 The eclectic color palette can be paired with most rooms and will provide a peaceful space for your little ones. The leathered fabric is free of toxic PVC and FSC certified. The ink does not fade with time and is built to last several years. Make sure to order a sample swatch before bulk ordering to see if this is the pattern for you. Bringing up children is the most rewarding job in the whole world. They bring so much joy to family life and add energy and life to any home. Young children have a tremendous creative power that should be channeled in the right direction. Which brings us to this wallpaper, it offers a modern twist on a nursery bedroom that your children will definitely love. The wallpaper features stars of different shapes and sizes, with some as small as tiny specks in the night sky while others taking a huge chunk of space. Each star has a slightly golden hue to it that offers a spectacular contrast gain the deep navy blue backdrop. The wallpaper can be washed without damaging the pattern or fabric. Application is easy as plug and play. A fun wallpaper with an uplifting atmosphere and fun charm that should inspire a ton of creativity in the minds of the little ones. It is bound to create a wonderful impact in any of your room, particularly your baby’s nursery. The artist was careful to restrict their choice of color palette to a subtle combination of navy blue and lustrous white, making it possible for the constellations to be paired up with most rooms. We were impressed by the feature rich wallpaper which offers sound insulation, making it possible to stifle noise from outside. It is also water proof and anti-mildew, which makes maintenance relatively simpler.